During the Second World War, when the American military determined that a highway through northwestern Canada to Alaska was needed for the war effort, four routes were considered. The route chosen in the end was an unofficial fifth proposed route that followed the already established Northwest Staging Route, a chain of airfields built through northwestern Canada. 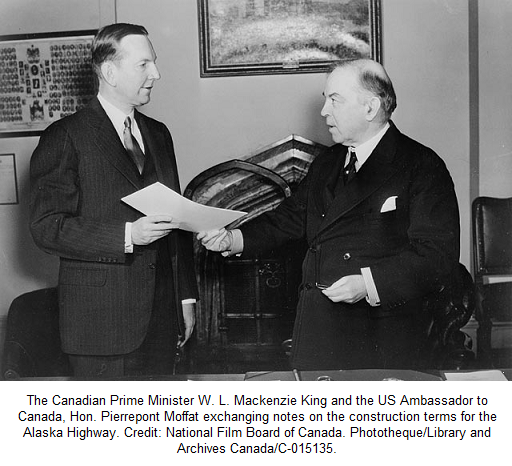 Even before the formal agreement between the Canadian and United States governments to build the Alaska Highway was signed on 17 March 1942, the first military personnel assigned to build the Alaska Highway were already on trains going north to Canada. Colonel William Hoge of the US Army Corps of Engineers was given the responsibility of initiating planning. He was simply told to follow the corridor of airfields already established for the Northwest Staging Route, and to have a pioneer road (a rough, first draft of a road) completed by the end of 1942. After that, the United States Public Roads Administration (PRA) would be responsible for upgrading the road into a two-lane, gravel highway. Hoge approached this massive project by dividing the highway into two parts. Col. James “Patsy” O’Conner commanded the southern section between Dawson Creek, British Columbia, and Watson Lake, Yukon, and Hoge commanded the northern section, from Watson Lake, Yukon into Alaska. The main administrative center for the entire project, known as the Northwest Service Command, was located in Whitehorse, Yukon.